Japanese chicken salad is far removed from what people generally think of as a western chicken salad and is quick, easy and healthy to prepare. It will generally only take approximately 40 minutes to make and allow you to experience a chicken salad from the far east in your own home. Unlike traditional salads, where the ingredients are all blended together, a Japanese chicken salad is placed on a platter, along with a Tahini based dressing, which enables people to help themselves to as much, or as little, dressing they like. First take a heatproof plate and, placing over simmering boiling water, place the chicken breasts on the plate and put in a steamer. Steamers are often underrated but are marvellous for this type of cooking and help retain the flavour of the meat. During the steaming process add a little sake and seasoning to the chicken breasts. The chicken meat should be steamed for approximately 15 minutes, but make sure it is properly cooked before removing it from the steamer. Once removed from the steamer place the chicken breasts to one side enabling them to cool. Take a large bowl and mix all the ingredients together. Next, using the juices recovered from the cooked chicken, add enough water to make 3 tablespoons of cooking juice. Once you have done this, add the made up juices to the contents of the large bowl, adding lemon juice if you choose to. The Tahini dressing should be kept separate from the chicken salad. 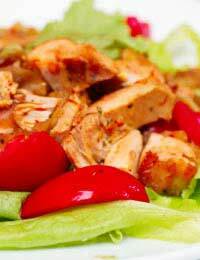 To prepare your Japanese chicken salad you first need to take the red pepper, cucumber and carrot and slice into thin strips. Next take the lettuce leaves and place them at one end of your platter, before sprinkling them with the shredded basil and mint. Next take the chicken breasts and slice them into strips before placing them on top of the lettuce leaves on the platter. Once you have done this you need to gather together all the other ingredients for the salad and place them attractively around the platter. The dressing should be in a separate bowl, allowing people to help themselves to the quantity of dressing that they want to go with their salad.